The Warner is one of New Haven's landmark buildings, perched above the shops on Sherman's Alley and adjacent to the esteemed Union League Caf�. Constructed in 1892, the building retains much of its nineteenth century charm, including period details and bay windows. It is one of Rufus G. Russell's last designs, calling forth the Romanesque Revival style. This building was commissioned by Henry A. Warner and was original used as a private dormitory for Yale University students. 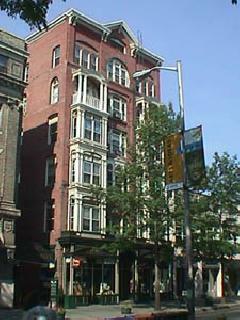 The Warner building was one of the first buildings designed as an apartment house in the city. Apartment rental prices include heat, hot water, and electricity. The building features include an elevator servicing all seven floors and a laundry room on the second floor. This Chapel District building is convenient to the Art and Architecture Building, the Medical School, and Yale�s central campus.